In a quarter filled with exhilarating highs and devastating lows for our democracy, small-dollar donors were the one constant we could count on. 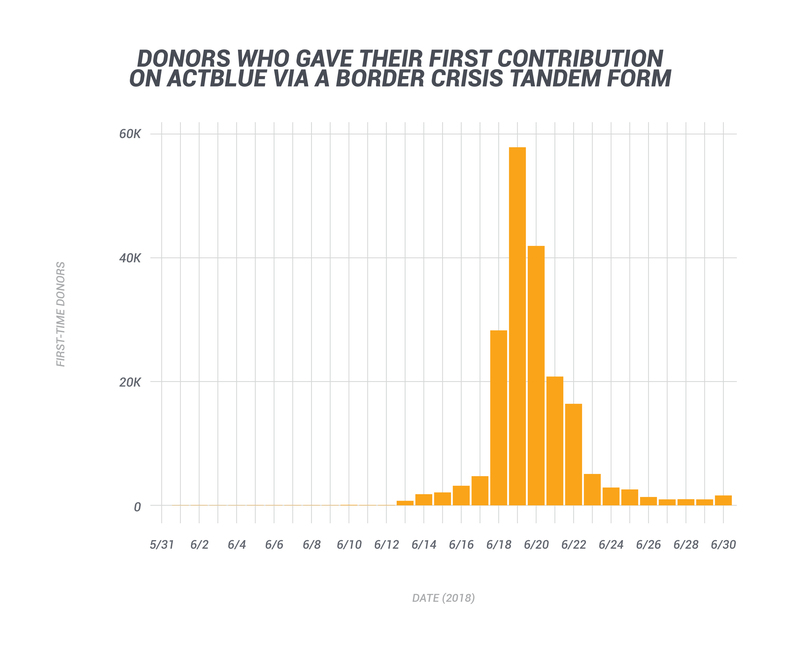 Not only did donors break fundraising records on ActBlue once again (more on that later), hundreds of thousands of people were moved to give for the first time this quarter. Many were activated by the Trump administration’s horrific separation of families at the border, as well as the new opportunity to vote for primary candidates who looked like them and embraced small-dollar donors over super PAC money. This increased participation is reflected in our latest cycle-to-date numbers: Small-dollar donors have now raised over $900 million this election cycle and are on track to hit $1 billion this summer! Additionally, the number of unique groups using our fundraising tools this cycle is nearly double the number that used us in the entire 2016 election cycle! Grassroots donors are truly uniting behind Democratic candidates and successfully leveling a playing field traditionally stacked by conservative mega-donors. Small-dollar donors aren’t just breaking cycle records — this was also the biggest quarter ever on ActBlue in terms of dollar volume ($210,747,320), and it includes our biggest dollar day ever (June 30 — $9,373,597). On top of all of that, we also officially crossed 5 million ActBlue Express users! Keep reading to see everything grassroots donors achieved this quarter. With so many brand-new grassroots donors getting off the sidelines and jumping in to help more candidates and organizations than ever before, we once again broke the record for the number of unique groups using our tools in a single quarter: 9,070 campaigns and organizations. Q2 was also our second-biggest quarter ever for number of contributions. Small-dollar donors gave 5,177,216 contributions, nearly matching the current record of 5,615,070 from Q1 2016, which was in the midst of a heated presidential primary! This is yet another example of the participation and activism we’re seeing build as we near November. Many of the new donors in Q2 were motivated to give to charities fighting for parents and children who were separated at the border. When the crisis began, activists and elected officials used our Tandem Fundraising feature to build contribution forms that listed multiple nonprofits advocating for families so that folks could support all of their work with a single click. Over 380,000 people gave their first contribution through ActBlue this quarter, and 51.3% of those folks gave that donation through one of these forms. With ActBlue Express, donors can save their payment information and give to any campaign or organization using ActBlue with a single click. In Q2, 62.2% of all contributions came from ActBlue Express, and 280,319 folks created ActBlue Express accounts. 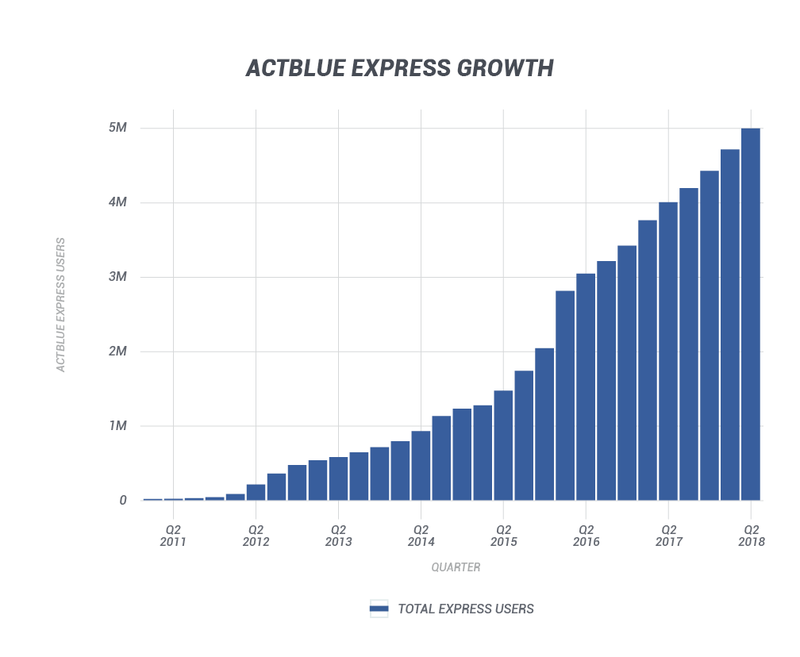 We officially hit 5 million ActBlue Express users on June 30 during the end-of-quarter rush — only a year and a day after hitting 4 million users in 2017! Recurring contributions sustain campaigns that have to make it from primary season to November and enable the nonprofits fighting for families at the border to support the affected children and parents for months to come. This quarter, recurring contributions made up 19.7% of total sitewide volume. Q2 made it more clear than ever before that we are living in a new age of American activism that is being powered by small-dollar donors. From protesting to voting to donating, the left put in an incredible amount of organizing that will set us up for victory this fall. And with months still to go until Election Day, we know this movement will only continue to expand! If you want to fundraise for your favorite campaign or cause, or if you have questions about this post, get in touch with us at info@actblue.com! This is a guest post written by Janice Chan, who often writes for our friends at Wethos over at The Nonprofit Revolution. In over a decade in the nonprofit sector, Janice has written fundraising appeals and grant proposals, led social media outreach, managed volunteers, executed rollout plans, managed donor and program databases, and learned the hard way that changing to a new website host means you’d better make sure that donation form still works! Ever played that team building game, “All Aboard”? You’re in a group and you are given say, a hand towel or a telephone book (showing my age here, I know), and the goal is to get everybody on board without anyone having a foot touching the ground. Depending on the variation or the prop used, the boat may get smaller (e.g. towel is folded in half) or your group may get bigger — and still you need to get everyone on board without any feet touching the ground. Often, working at a nonprofit organization can feel that way. You’re trying to serve the same number of people with fewer resources, or serve more people with the same amount of resources. This metaphor is not only apropos to programming, but to fundraising as well. You’re trying to raise funds from more supporters (get more people on board) with the same number of staff or resources. And yet, the more you raise, the more people (donors and clients) you can get on board. It does not need to be an endless game of chicken, egg, chicken, egg. That’s why you focus on major gifts and/or grants, right? We know it’s important to respect donors at all levels, but in terms of where we spend our fundraising resources (time, budget, attention), it is clear that we prioritize funders who can give large gifts. But it’s easy to take those smaller dollar annual gifts for granted — just send or share it out to enough people and build our lists and followers because it is a small percentage of volume, volume, volume. We tend to believe, particularly if we are smaller organizations, in the myth of scarcity. That if we spent time focusing on small-dollar donors, it would take away from the time we spend on major gifts and grants, and that would cause much bigger problems if we didn’t have those. We act as if this were a game of musical chairs instead. And so we close ourselves off to the people who could help us. Worse, we leave people feeling like their contributions won’t matter unless they can write a check with more than two digits in front of the decimal point. The trick to playing “All Aboard” is that when you have more people, you can use each other to hold all of you up. The more people you have, the more people you can get on board. This is not musical chairs. But you have to involve every person on board. Valuing small-dollar donors isn’t simply the right thing to do; it’s a key part of any smart fundraising strategy. Small-dollar donors provide increased revenue, can be more vocal supporters and ambassadors for your organization once they’ve invested in your work, and can donate multiple times. Valuing donors is not about what we say but whether our donors feel like they matter to us. You know how we rush to address whatever it is that a major donor, funder, or board member raised as an issue, no matter how small? Or how we otherwise pay attention to all aspects of their donor experience? Sometimes it’s because they are important details; sometimes the details are simply important to them. Donor experience is key at all levels. What if we took the same care and put the same level of thought into how all of our donors experience supporting our organization? Note that I said thought, not necessarily time. Often, we know more than we give ourselves credit for knowing. Like the fact that increasing numbers of donors give via mobile devices. Or that A/B testing is an effective way to experiment and see what works best for your particular donors. But getting there seems overwhelming and, as a small or medium nonprofit, like it’s out of our league. However, technology advances all the time but so do the services available. Customizable, data-driven online fundraising platforms are no longer as out of reach as you think — not in cost or in staff capacity to manage and maximize. Two, create a plan to grow the number of small-dollar donors. Giving Tuesday doesn’t just magically happen as some type of positive penance amid the Cyber Monday hangover (Cyber Monday also not being a natural consequence of Black Friday). And remember how we talked about involving every person on board? Traditionally, fundraising has been about moving donors up the ladder of engagement over time, from smaller annual gifts to larger major gifts. But that’s ignoring a subset of donors who, for various reasons, wish to give lower amounts, or who perhaps would rather give smaller amounts more often, a.k.a. recurring gifts. Flip the ladder of engagement sideways, like a platform you can build on. Challenges and matches can be a successful strategy for getting people on board, while giving your major donors a new way in which to support your organization and grow your capacity. Three, set a goal to encourage recurring gifts from small-dollar donors. Yes, we can ask small-dollar donors for recurring gifts, and yes, we can receive them. Even if the amount per donation is lower, the recurring nature means that a donor will likely give more than if you had asked them for a one-time gift. For example, you might only get $25 as a one-time gift but the same donor might be willing to pledge $5/month for 12 months (and $5 x 12 = $60). You know what else? It is also a sign that this donor is more connected to your cause and your organization, which means they will probably be more likely to respond to your other calls to action. It’s also easier to ask friends to give when, hey, you support this organization every month. Four, for any goals, figure out how you’ll evaluate your progress. A big benefit of grassroots fundraising? Sample size. This makes it much faster to figure out what’s working and what isn’t. And whereas some donors may be fairly forthright about why they did or didn’t give to you, raising money online also gives you the benefits of tracking things like how many people visit your online donation page without clicking through — and where they dropped off in the process. Five, apply what you’ve learned to value your grassroots donors. And like that Brian McKnight song, we are back at one. Best practices are not without merit, but they are not based on your particular organization or your supporters. Use what you learn to continue to figure out how to make all your donors feel valued, respected, and like their contribution matters. This will change over time. Good thing is that so do the tools and resources available to us. You do what you do because your organization believes in our capacity to be better, in our capacity to make the world better. Believe in the capacity of your grassroots donors. This post was written for AB Charities in partnership with Wethos and also appears on their blog, The Nonprofit Revolution. Since Trump’s election, small-dollar donors have been fired up and actively engaged in trying to change our country’s future. We’ve reported back every quarter on how grassroots supporters have been besting past election cycles and breaking records, but this past quarter was truly astounding. Thanks to small-dollar donors, Q1 2018 was our biggest quarter ever (beating out every quarter of the 2016 election! ), with a total of $180,737,948 raised. Additionally, we’ve already raised $702,744,083 in the 2017-2018 cycle and will be hitting $750 million in a matter of weeks. For comparison, our total for the entire 2015-2016 cycle was $746 million. 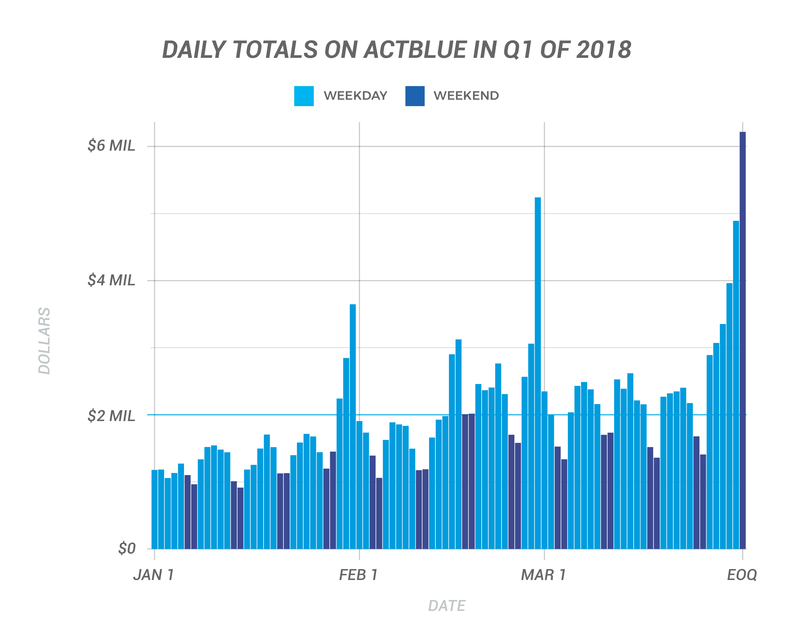 There were also a record-breaking number of campaigns and organizations raising on ActBlue in Q1 2018 — 7,838 in total. And there have now been over 10,000 groups who have raised money through our platform during the 2017-2018 election cycle, another sign of how truly massive the resistance movement has become. Below, you can see the extraordinary growth in groups using our tools during this cycle. This is an increasingly diverse set of groups that includes national advocacy organizations and local nonprofits in addition to campaigns of all sizes. That means supporters will have plenty of places to direct their energy after election season ends. We’re experiencing a historic moment in the small-dollar donor movement, and it’s not even a presidential election cycle! Please note that Y1 on this graph refers to the first year of the election cycle, and Y2 refers to the second. Grassroots donors also propelled us to another milestone this quarter: On January 4, we officially hit $2 billion raised in the lifetime of our platform. We only hit the $1 billion mark in March 2016, in the midst of a spirited presidential primary. An unparalleled amount of organizing from concerned citizens and activists helped us double that in just under two years! Small-dollar donors made 4,659,660 contributions on ActBlue this quarter, and they had many reasons to give. In addition to some special elections and the start of primary season, folks were fired up about government shutdowns, the ongoing fight for DACA, and organizing for gun control. We got to our record total of $181 million raised this quarter thanks to remarkably consistent daily totals. In Q1, there were a record-setting 38 days when candidates and organizations raised more than $2 million — including every weekday in March! In the chart below, you can see how steady donations were, especially during the work week. There’s so much unprecedented grassroots engagement right now that we decided to compare the 2018 election cycle so far to the same timeframe in past cycles. Across all metrics, it’s clear that Democrats have more grassroots support going into this election year than ever before. 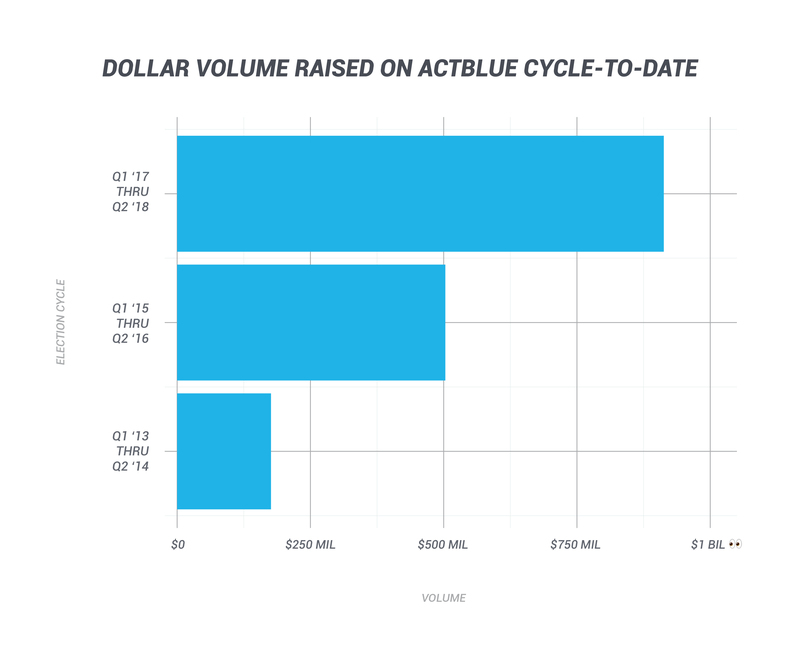 In the graph below, we break down fundraising totals on ActBlue for these election cycles by quarter. With so many small-dollar donations coming so early in the 2018 cycle, Democrats will be able to keep up with Republicans bankrolled by mega-donors right up to Election Day. In January we officially hit 4.5 million ActBlue Express users, and by the end of March we had over 4.7 million! 290,744 people saved their payment information with us this quarter and can now give to anyone on our platform with a single click. In a real show of commitment, 43.4 percent of the ActBlue Express donors who gave in Q1 made more than one contribution, and 38.7 percent gave to more than one group! We’re looking forward to hitting 5 million ActBlue Express users next quarter, in time for the heat of election season. 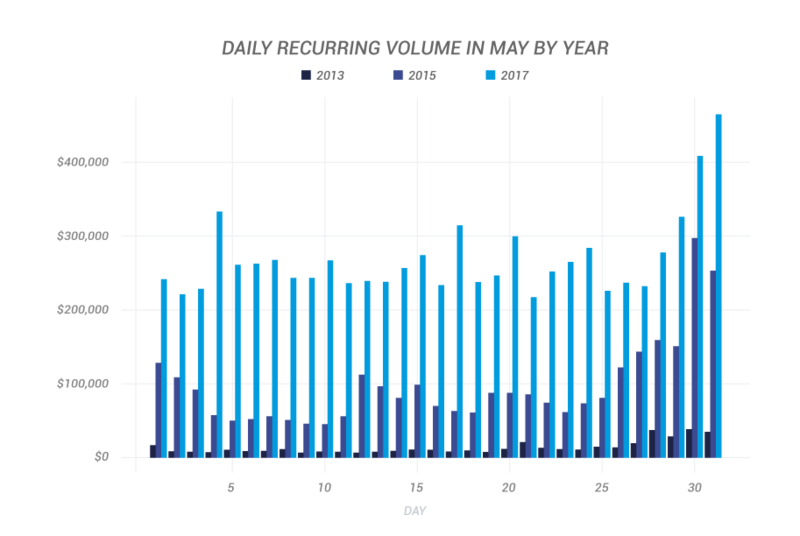 Twenty percent of Q1’s total volume came from recurring contributions. Now that we’re only seven months away from Election Day, recurring contributions are more important than ever for Democrats running for office. When donors chip in monthly contributions, campaigns can budget ahead of time for ads, events, GOTV efforts, and more so they’re not out of cash at crunch time. We added six (!!) new customer service experts to our team this quarter. With a record number of first-timers running for office and new folks supporting them as grassroots donors, we want to make sure we can answer any and all questions. This quarter, small-dollar donors set Democrats up for success. We know the midterms won’t be easy, but with so many records already being crushed, the left has the energy and the resources to win in November. If you want to get your campaign on ActBlue (it’s never too late!) or need help fundraising for your favorite cause, or if you have questions about this post, contact us at info@actblue.com. Hi, I’m Rachael from the Outreach Team at ActBlue, stopping by the blog to talk about the (amazing) outcome we saw this past Election Day. I work with state and local candidates and teach them how to use our platform to build campaigns funded by small-dollar donors. I’ve been traveling across the country in 2017 doing this work, and I’ve gotten to see firsthand the incredible surge of folks getting involved in politics at the state and local level since the 2016 election. 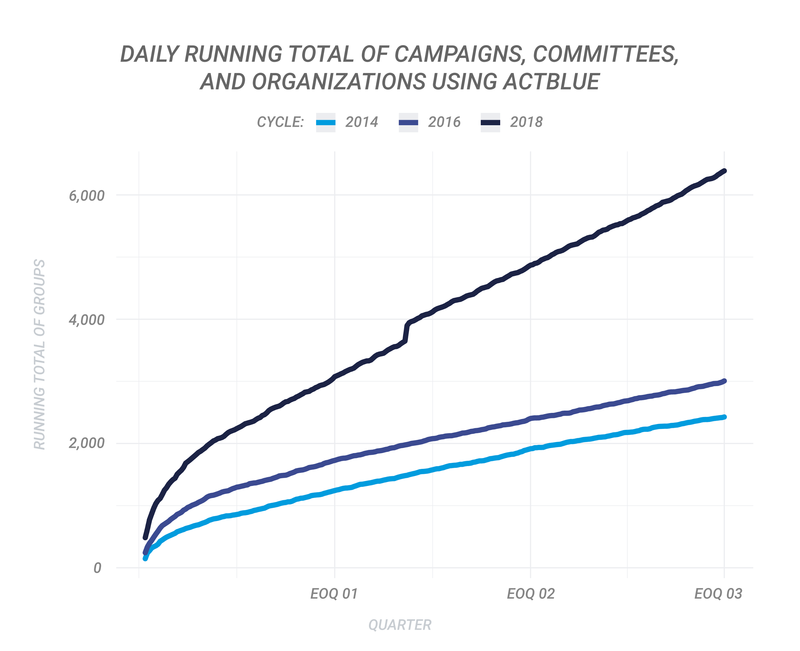 We talk a lot on our blog about the huge impact small-dollar donors have on campaigns and organizations across the country, and we’re proud to make that possible with our tools at ActBlue. The 2017 elections were a great reminder that donors and activists are making a bigger difference than ever, and that when small-dollar donors chip in to support the candidates they care about, those folks have the resources to win their races. During this month’s elections, Democrats picked up Republican seats in deep-red Georgia and flipped control of the legislature in Washington. The first openly transgender woman, Danica Roem, was elected to the Virginia state house. The first black woman, Vi Lyles, was elected mayor of Charlotte, NC, and the first woman, Joyce Craig, was elected mayor of Manchester, the largest city in New Hampshire. And those are just a few of the biggest highlights. My team and I were excited to see so many of the Democrats we work with have a successful election night. And it was amazing to see voters and activists so invested in campaigns at the state and local level. Why exactly were they so enthusiastic to help out and vote for these candidates? Voters now have a clear picture of how things go when Republicans are in charge, and thankfully, a lot of people took advantage of their first chance to show they don’t approve. What else? People ran for office. It’s that simple. Instead of allowing Republican incumbents to hold on to their power any longer, Democrats came forward to run against them. And these candidates built winning races with help from grassroots donors, who chipped in what they could to support their efforts. In Virginia specifically, state and local campaigns raised over $12 million in 2017 from over 200K contributions made by small-dollar donors using ActBlue. And that’s compared to over $3.4 million raised from 33K contributions in Virginia’s state and local elections in 2015. (Note: There was not a VA governor’s race in 2015.) And the contributions for this year’s races paid off big time. Political strategists were pretty adamant that Democrats didn’t have any chance to take back the Virginia House this year, but of the 17 seats we needed to flip to win the majority, we flipped 15 and nearly toppled the GOP’s power. And 12 of those 15 candidates beat a Republican incumbent. To top it all off, 100% of the challengers who beat Republican incumbents in Virginia used ActBlue to raise small-dollar donations and build their campaigns from the bottom up. We’ve been working hard to expand our reach in local jurisdictions this year, so we can help candidates in every race build winning grassroots campaigns, just like they were able to in Virginia. Our compliance staffers have cleared 100 jurisdictions so far in 2017, and those are all places where new candidates can now use ActBlue to fund their campaigns. And as we expand further, staffers like me are getting out on the ground in these areas to train candidates on the best practices of small-dollar fundraising. We truly believe in the power of grassroots donors, and we know candidates can build winning campaigns when their supporters chip in $5 or $10 online. In fact, small-dollar donations are especially impactful at the state and local level where candidates typically don’t need to raise millions of dollars in order to build a winning campaign. That’s why we’re doing this work — so you can give to local and state campaigns in every election, at every level, and help create real change in your communities. You might not be able to volunteer to knock doors for every race, but you can make a difference in the work being done to bring Democrats and their policies to the state and local level. Groups like Indivisible, Flippable, and Run for Something are great resources for voters and small-dollar donors to learn about important races all over the US. And aside from contributing and volunteering, you can actually run for office. Since the 2016 elections, more groups and resources to support new candidates have sprung up than ever before. We even celebrated the first ever National Run for Office Day this month with Run for Something, where folks at the ActBlue office heard from Boston City Councilor-Elect Lydia Edwards, the first woman to ever hold her seat. It’s becoming clear that if you have the passion and drive you can run for office and you can win. And at ActBlue, we’ve got the tools to help first-time candidates build powerful movements. Who knows, you just may be the next state representative, mayor, or city councilor to go on to become the President of the United States. We want to hear from you so we can help! Who are you supporting? What are you running for and where? You can check out the local jurisdictions we’ve cleared here. If you’re running for an office that we don’t currently have listed, reach out to us at info@actblue.com and we’ll work to get that cleared. And if you have questions about running for any office from the top of the ticket on down, just drop us a line at info@actblue.com. The end of 2017 is rapidly approaching, and with that comes holidays, shopping, and something that’s likely on a lot of fundraisers’ minds right now: giving season. Giving Tuesday (November 28th), the official kickoff to giving season, has become a prominent, global day of generosity, falling immediately after big shopping days like Black Friday and Cyber Monday. It’s the start to an end-of-year period when people are driven to give back. In 2016 on Giving Tuesday alone, nonprofits raised over $168 million globally, up a whopping 44% from 2015. And the giving won’t stop there — 30% (!!) of all nonprofit giving happens from Giving Tuesday through the end of the year. That adds up to a whole lot of groups making appeals for support on the same day, and a crowded marketplace as you work to hit your fundraising goals. Folks tend to be feeling generous as the year comes to a close, and some have likely even planned ahead to make charitable contributions in the last month of the year. That’s why nonprofit fundraising teams should plan ahead as well, so you can have a strategy in place to reach those excited supporters multiple times during giving season, when they’re already inclined to chip in. The more prepared your organization is, the better. If you’re a nonprofit fundraiser, you’ll find our top tips below for preparing your giving season fundraising campaign. As you make progress on your plans, we’re available to answer questions or talk strategy at AB Charities, so let us know how we can help. And if you’re not set up to use our tools yet, there’s still time — most organizations can get set up within a day or two! Decide on a goal and make your donors feel like they’re invested in helping you hit it. You should focus on a measurable, realistic goal that you know your supporters can help you reach — and you should let your donors know about it! When there’s a tangible goal in mind, donors feel more motivated to give and help you succeed. Outline, write, and prepare your content ahead of time. You’ll want to be prepared for both Giving Tuesday and the larger end-of-year push that comes afterwards. Having one or two emails prepared likely won’t be enough content to help you hit your goal. Take some time to brainstorm with your team and think through the different stories you want to tell and what fundraising emails, graphics, social media content, or blog posts you’ll need to get those messages across. And remember that above all, you want to tell a compelling story and incorporate urgency and emotion. Let your donors know why they should care about your work right now, why you need their contribution, and what you’ll be able to do with their donation if they give. You can also prepare thank-you text to send out to donors. AB Charities will send out a receipt automatically when people donate, but you can easily customize that language to thank your donors and add it to your fundraising page ahead of time, so every time a donor contributes they’ll receive your note. Brand your contribution forms for Giving Tuesday. Giving Tuesday has become a way for supporters to feel like they’re a part of an incredibly large, global movement for positive change. When you brand your contribution forms to show donors that you’re asking for their support as a part of your Giving Tuesday campaign, it can help donors feel even more motivated to make a contribution that will help you reach your goals. Using AB Charities, it’s quick and easy to add a branding to your forms that fits in with the look and feel of your Giving Tuesday campaign. If you have questions about creating a branding find more info here or contact Kiersten from our advocacy team at arnoni [at] actblue [dot] com. Connect with folks in your organization’s community ahead of time and invite them to participate in peer-to-peer fundraising. If you have supporters who are willing to put in a little work for your cause, you can make them an AB Charities contribution form and encourage them to organize their networks by emailing or posting on social media to help broaden your reach. Those folks who are already engaged in your organization’s work can offer compelling appeals for support by telling their personal stories or offering unique perspectives as to why your organization needs their donation. You can also get board members involved and make them their own fundraising pages, so they can keep track of fundraising goals and help you hit them. Your organization’s staffers can log in and check on the progress of the peer-to-peer and board fundraising pages, saving your team a ton of time! Include a pop-up donation ask on your website. With so many donors planning on giving and researching causes they want to support, it’s common for charitable groups to experience high traffic on their websites from Giving Tuesday through the end of the year. Building a pop-up ask into your giving season campaign is a great way to meet your donors where they already are. 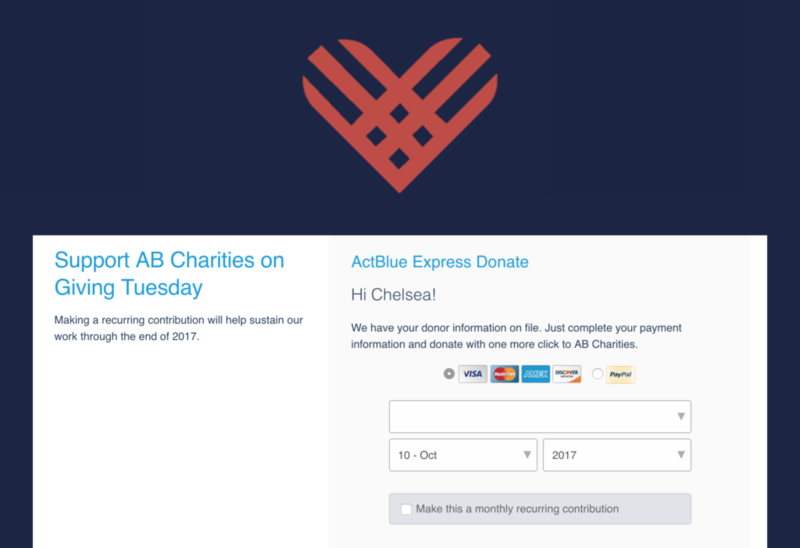 Using AB Charities, ActBlue Express users can give easily with a single click on your pop-up. 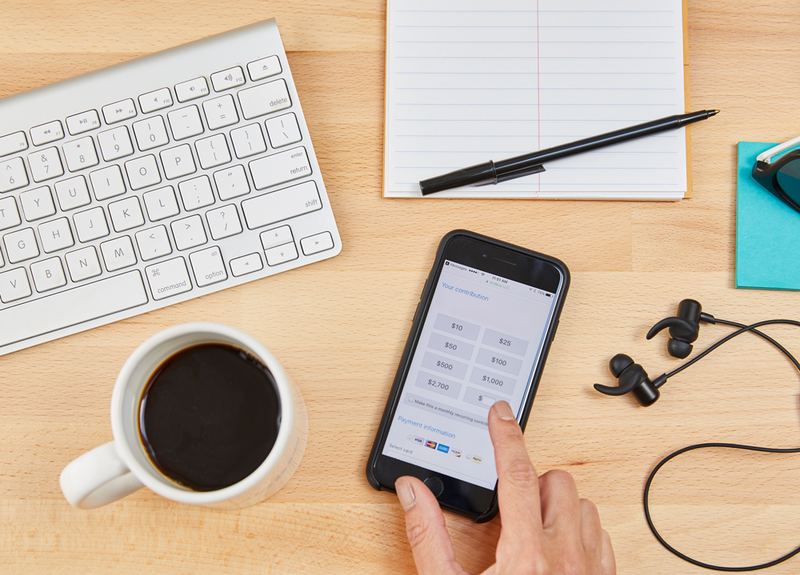 This will make it especially simple for donors who access your website via their phone or tablet — no typing in their credit card number to complete a donation. Make a recurring ask to seize the momentum of Giving Tuesday and keep supporters engaged long-term. Many groups focus on bringing in one-time contributions to hit their goals, but we recommend asking for weekly or monthly recurring contributions. Recurring contributions are a great way to capture the excitement of giving season and turn it into long-term success. When you know you have a certain amount of money coming in each week or month from recurring donations, you can budget and plan ahead for the future. With AB Charities, you can set a deadline at the end of the year so donors can contribute a small amount each week from Giving Tuesday on, or you can set recurring contributions to run indefinitely every month, so you can keep the momentum going into the new year. Donors will feel invested in your work and you’ll be able to rely on a steady stream of donations even as giving season comes to a close. Taking the steps above will help you have a solid plan in place and will set you and your team up for success. AB Charities allows you to track the performance of your contribution forms and how donors are responding to different content, social media asks, or email pitches in real time. If you’re interested in learning more about our tools, have questions about preparing for Giving Tuesday, or want to run a test between AB Charities and your current platform, just let us know. You can drop Kiersten a line at arnoni [at] actblue [dot] com. We wish you good luck during giving season, and can’t wait to see your fundraising campaigns in action! 2017 has been a huge year for fundraising on the left as more Americans make fighting back against Trump and the GOP part of their daily lives. We knew there was a lot of momentum going into Q3 but wondered if the summer would slow anyone down. The numbers show the resistance is still going strong. We helped raise $108,108,700 for Democratic campaigns, progressive organizations, and nonprofits doing hurricane relief work — nearly double what we helped raise during the same period in the 2016 election cycle — from 3,178,688 contributions. Organizations large and small worked tirelessly to respond to Trump’s DACA repeal and congressional Republicans’ attempts to replace the ACA, and an historic number of folks decided to run for office. All of this work was powered by small-dollar donors giving to the causes and candidates they believe in. 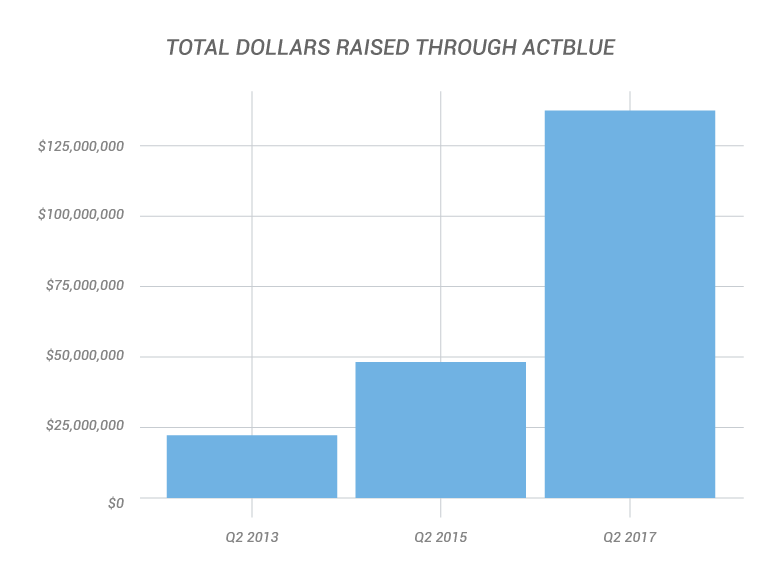 As a result, a record-breaking 5,225 groups raised money on ActBlue in Q3 — more than ever before in our history. This surge of activity helped break another record. By the end of Q3, campaigns and organizations using our tools had raised over $350 million since the beginning of the calendar year, despite the fact that midterms are still more than a year away. The only other time we’ve handled $350 million in an election cycle was in the most recent election. We hit that mark in March 2016, 13 months into a very active presidential race. Donors are participating at unprecedented levels, and candidates are laying the groundwork they need to run strong campaigns up and down the ticket in 2018 and beyond. ● There were 658 local candidates and committees raising money on our platform in Q3, which is 4.6 times higher than Q3 in 2013 and more than double our Q3 2015 total. Our team has been busy clearing local jurisdictions so that more candidates for offices like city council and school board can run people-powered campaigns and make a difference in their communities right now. ● 1,026 candidates for governor, state house, and state senate used our tools this quarter. That’s nearly double the amount of candidates compared to this time in 2015. ● A total of 804 candidates for federal House and Senate seats were raising money from small-dollar donors in Q3, three times as many as in the last two election cycles. And progress isn’t limited to elections: 293 (c)4 advocacy organizations raised money this quarter. The following graph shows just how many more groups were raising in Q3 than at the same point in the last few election cycles. This trajectory shows us that people are extremely engaged, and at ActBlue we’re working hard to make sure they have the tools they need to succeed. Our integration with Account Updater, which we offer at no additional cost, is one of those tools. If a donor has a recurring contribution on ActBlue and loses their card or their credit card company issues them a new one, this feature updates their card information automatically. 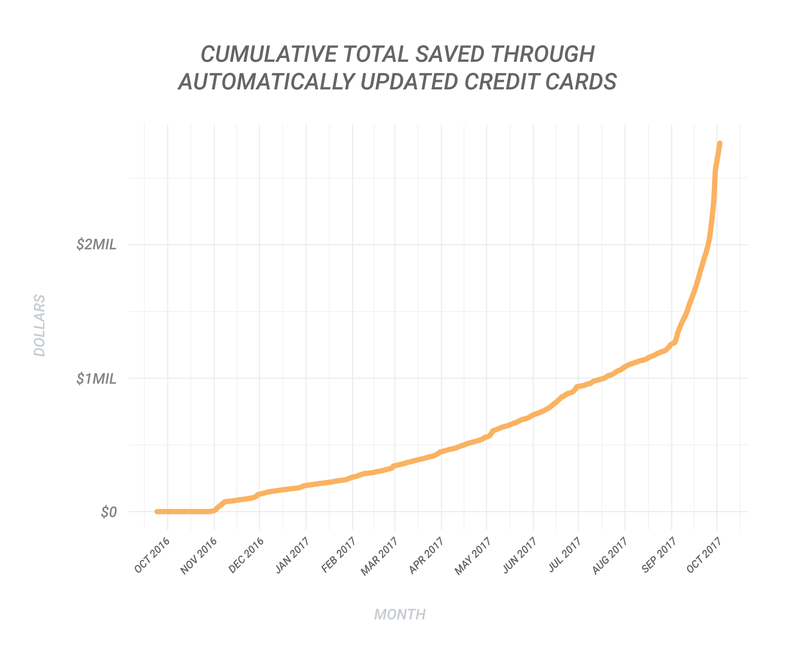 September was a particularly good month for Account Updater, with 17.4% of recurring contributions being updated with a new card. (For comparison, we usually update around 1% of recurring contributions per month.) Updates in September alone ensured that $859,466 worth of small-dollar contributions made it to the campaigns and organizations donors wanted to support, at no extra cost to those groups or donors. In the graph below, you can see the total amount of money saved by Account Updater since we started using the integration. Q3 was full of difficult days for our nation. From natural disasters to crises created by Trump and the GOP, small-dollar donors channeled their sorrow and disgust into action. The graph below shows our daily fundraising totals for the quarter, along with the biggest news stories of the last three months. 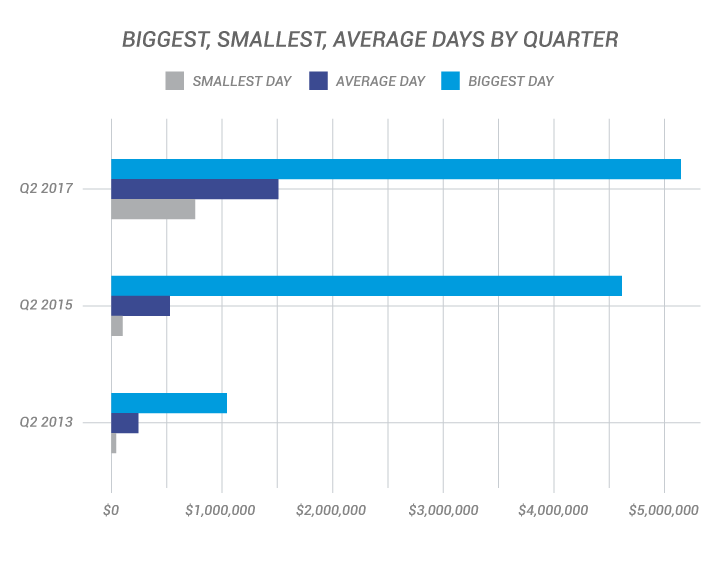 The biggest days of the quarter were the end of each month and the end-of-quarter deadline, which are traditionally the most important fundraising days of the year. But the health care fight in July also led to an uptick in support, as did the hurricanes that hit at the end of August and September. Supporters who had previously given via ActBlue forms were able to quickly give to disaster relief organizations on AB Charities through Tandem forms, which allow donors to split one contribution between several groups. We saw a steady bump in traffic in the days following those natural disasters as more and more news came out about relief efforts. Overall, 31,448 small-dollar donors gave to charities through Tandem forms and 274 charities raised money on AB Charities in Q3. Making giving as frictionless as possible is crucial to the success of fundraising campaigns. 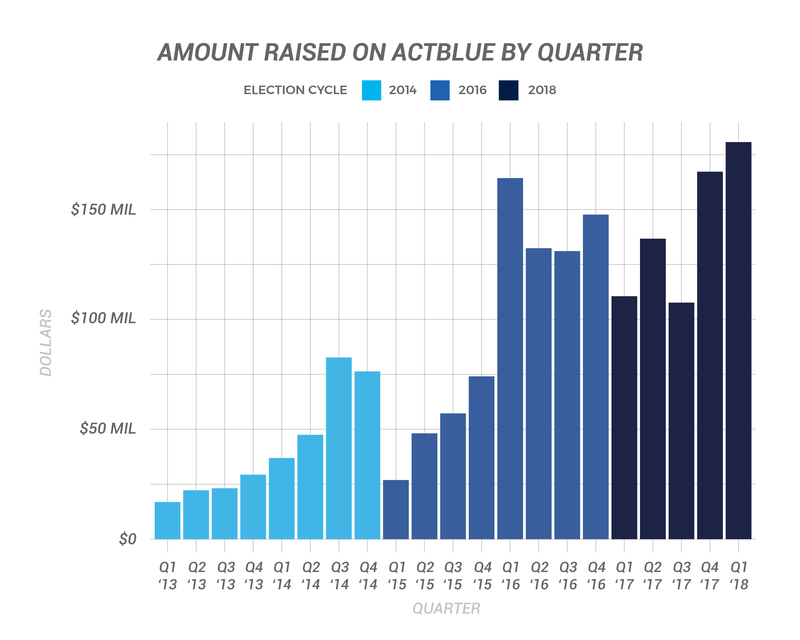 ActBlue Express enables more than 4 million small-dollar donors to give to any group on our platform with a single click, and its importance is reflected in this quarter’s numbers. 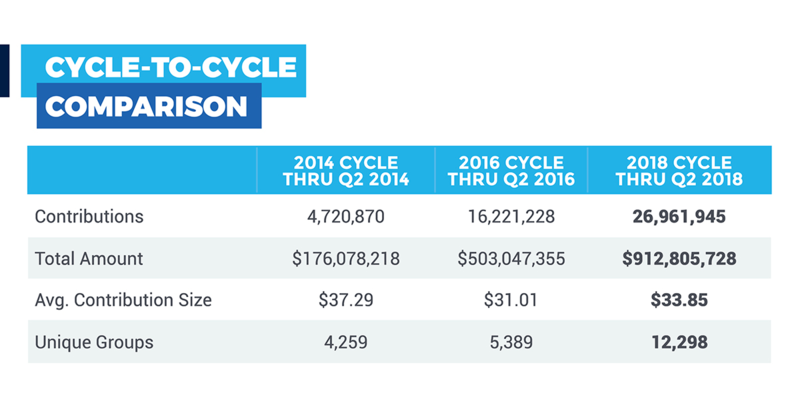 ActBlue Express users raised $64,516,271 in Q3, almost double their haul in 2015. There were also 189,331 donors who signed up for ActBlue Express this quarter. Recurring contributions help campaigns and organizations plan for the long haul. This quarter, 46.3% of total contributions came from recurring donations. After the devastating hurricane season, we were heartened to see people ask for recurring donations to support relief efforts. Donors often want to give in those moments, and a recurring ask can create a more sustainable recovery effort. 41% of all contributions this quarter were made via mobile, and because ActBlue Express donors can easily give on any device, 42.4% of ActBlue Express contributions were mobile as well. Additionally, 5.4% of all mobile contributions were made via Apple Pay (70,490 contributions in total). It’s clear that anyone doing digital organizing today needs to be using a mobile-first mindset. With a president who likes to govern by tweet, mobile optimization is more important than ever. Q3 was a true success thanks to the emerging deep bench of Democratic candidates and passionate organizers around the country. We’re thrilled to help so many people-powered movements fundraise online. And we expect Q4 to bring even more small-dollar donors into the fold, with campaigns continuing to build for 2018, state elections in Virginia in November, and Giving Tuesday just a few weeks later. If you have any questions about our tools or need advice on how to use them, contact us at info@actblue.com. 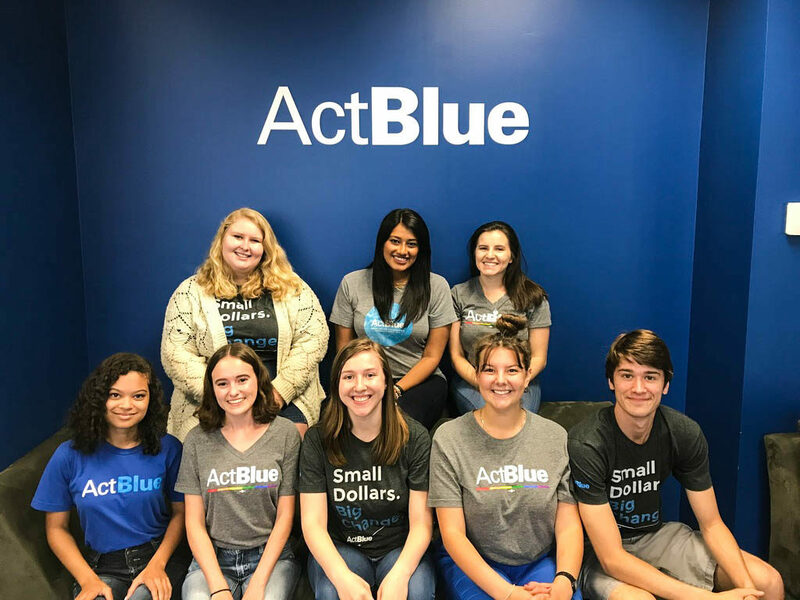 We hire a team of paid interns every semester at ActBlue, who are interested in everything from politics to law to writing and marketing. They come to us from varying college majors, hometowns, and backgrounds, and they bring unique perspectives and ideas to the ActBlue team. It’s our goal to help them learn the ins and outs of ActBlue and show them what it’s like to work in politics, as well as within the larger grassroots movement. Perhaps most importantly, they’re able to explore how their own interests and skills can play a role in their political work. I can speak to the intern experience first-hand, since I myself started interning at ActBlue in 2014. The work I did was extremely rewarding — I knew that every task I completed played a part in the larger mission of ActBlue, and I also knew that I was gaining some great experience to take with me after college. I started as an intern during the summer before my senior year of college as a writing and literature major. I knew I wanted to write, but I also had a passion for politics and I had no idea those interests could intersect so perfectly. Before I started with ActBlue, I didn’t know that the job I’m currently doing existed. When I thought about working in politics, I only thought about actually running for office or working on a campaign. I didn’t realize the scope of the work being done, or how fulfilling that work could be, but my internship introduced me to a host of new opportunities and ways I could make a difference. Since I graduated, I’ve been a full-time staffer, working with our Marketing Team and building a career in digital organizing. That means I’m now on the other side of the internship program, and it’s been amazing to see how excited our interns are about Democratic politics and how inspired they are by the strength of the small-dollar donor movement. They’re the kind of enthusiastic, passionate activists that are going to play a big role in all the work we’ll be doing on the left in the coming years and we’re grateful we can be a part of their stories. Jess, Deb, and Monika worked on our Customer Service, Marketing, and Outreach teams. They’re moving on from ActBlue to new adventures in the fall, so we chatted with each of them to hear about their experiences. It’s been extremely rewarding to see the incredible ways ActBlue’s platform has been able to support the resistance. I’ve seen first-hand that people are not sitting by and letting this country fall at the hands of Trump and the GOP. They’re running for office. They’re donating to really great candidates. They’re starting PACs and advocacy organizations, and they’re building powerful networks of small-dollar donors who can respond to attacks on things like our healthcare within hours. It’s been really eye-opening to see the power of grassroots organizing and it reminds me that all hope is not lost. During my internship, I had to juggle multiple projects with different demands and time commitments. I got to expand on my abilities to prioritize and multitask, while also learning how to design projects on my own. But my favorite part of being an ActBlue intern was the exposure I got to the national political landscape from right here in Somerville, Mass. Each team at ActBlue plays a unique part in the political process, and I’m so grateful to have been able to see things from different angles throughout my time here. When I started interning last year, I wanted to find a workplace where I could play an active role in Democratic politics in the months leading up to the election, while still being able to develop my personal and professional interests. I’ve been exposed to so many different organizations and individuals who are doing really great advocacy work throughout the country. I’ve been able to expand my view of nonprofits who work in this space, but I’ve also been able to develop my own intentions and ambitions as I move forward in my career. The energy and drive we see in our interns every semester is inspiring to all of us, and a sure sign of all the great activism and work that’s going to be done in the upcoming years. We’ve already completed the intern hiring process for the fall, but should be accepting applications for spring interns in mid-to-late October. If you’re interested in applying, we encourage you to check back. Aside from all the great experience they receive, our interns are paid, provided with a transportation subsidy, and all the snacks and coffee they need to get them through interning and taking classes. If you have questions about our internship program, drop us a line at internships@actblue.com. At ActBlue it’s always been our mission to help people across the country run the most effective small-dollar fundraising programs. One of the ways we do that? We make sure the groups using our tools have easy, real-time access to their fundraising data, so they can budget, plan, and strategize. If you’re an ActBlue admin user you’ve probably gotten used to receiving a fundraising update from us every morning. And you might have noticed that we recently gave those fundraising updates a makeover. We want to hit your inbox every day with stats that make the most sense for you and your team because we know it’s critical (especially right now) that you have meaningful, actionable data to work with. The change that’s probably most noticeable in your inbox is the new subject line for the update emails. We switched out “You’re making a difference” for the total dollars the group or groups you work with raised on the previous day. You can see an example of the new subject line in the screenshot below. Rest assured, you’re still making a difference — we just won’t be telling you every day. With the new subject line, even if you don’t have time to open your email during a busy morning, you’ll still get an important topline stat in the notification you receive first thing — your most recent day’s fundraising total. 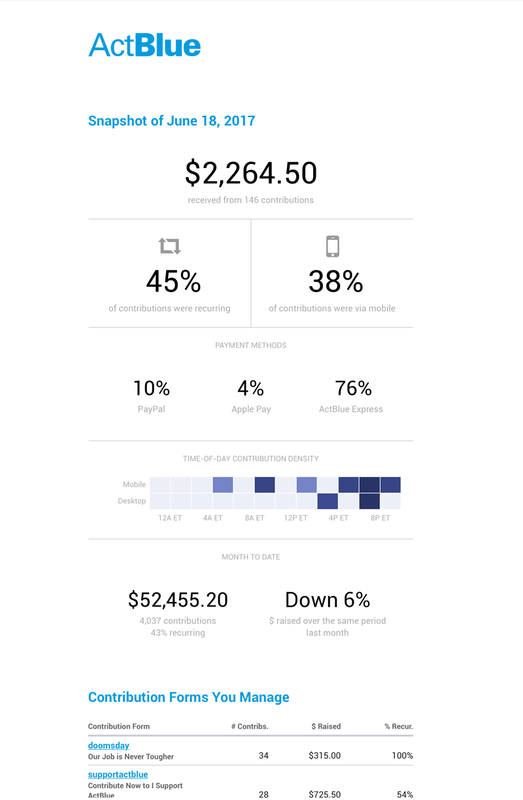 Your daily update email includes data like month-to-date fundraising stats, the percentage of contributions that came in via specific payment methods — including ActBlue Express, Apple Pay, and PayPal — as well as a table listing each of the groups you manage, the percentage of contributions that were recurring, and the percentage of contributions that came in via mobile. Please note that the stats you receive in your daily update email will vary depending on the number of groups you manage on ActBlue. At the bottom of your daily update email, you can click on “Get Help” to send us an email if you have questions about your recent fundraising, or if we can be of assistance in any way. You can also click on the link just below that to change your email preferences. You can choose to receive daily update emails every morning, or opt out of receiving them altogether. If you want to receive an email every morning, choose “Nightly” in the dropdown menu next to Site Activity Emails. This means that our system will analyze your fundraising activity every night, compile the data and send it out to you in the morning. If you don’t want to receive any updates, just choose “None” in the dropdown. We hope you and your team will find these insightful, and that the new data we’ve incorporated will help you hit the ground running each day! If you have questions or comments about the daily update emails, you should feel free to drop us a line at info@actblue.com. Back in April, we published some record-breaking numbers for Q1. It was a powerful sign that the resistance was fighting back against Trump. But it wasn’t a one-off moment. In Q2, as we got farther away from Trump’s inauguration and marches across the country, which were rallying points for many people, those record-breaking numbers only got bigger. It’s a sign that the resistance isn’t slowing down, but deepening and organizing to win. There were some big moments during Q2 — special elections and the House healthcare vote — but those were only small parts of the story. Thousands of groups took action (in fact, more campaigns and organizations raised on ActBlue than in any quarter before! ), and more supporters chipped in to support the candidates and causes they believe in. We handled 4,654,994 small-dollar contributions and helped campaigns and organizations bring in $137.4 million, which is nearly three times our Q2 2015 total (the best year for comparison, given that it was the first year of the most recent election cycle). It’s also larger than our Q2 2016 total ($133 million), and that was during the height of the presidential primary! One of the biggest reasons for this huge growth is the increase in the number of campaigns and organizations that are fighting back and using our tools to engage with supporters and fundraise. We helped 4,293 groups raise money in Q2 — that’s the most ever in a single quarter, and it by far exceeds the number of groups that would normally be raising at this time during an election cycle. 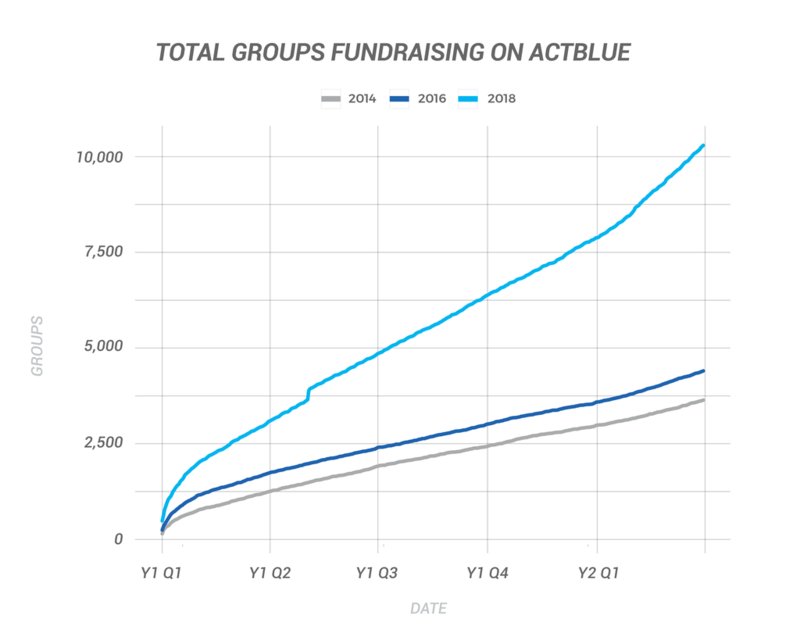 Of those groups, 1,374 raised their very first dollar on ActBlue in Q2 (909 campaigns and 465 organizations). Oftentimes candidates wouldn’t have declared at this point in the cycle, especially if they’re running for local office, but people are fired up right now. And that early money is going to help them build powerful campaigns down the line. The last quarter wasn’t successful because of any one of these groups, or because of any handful of big days. 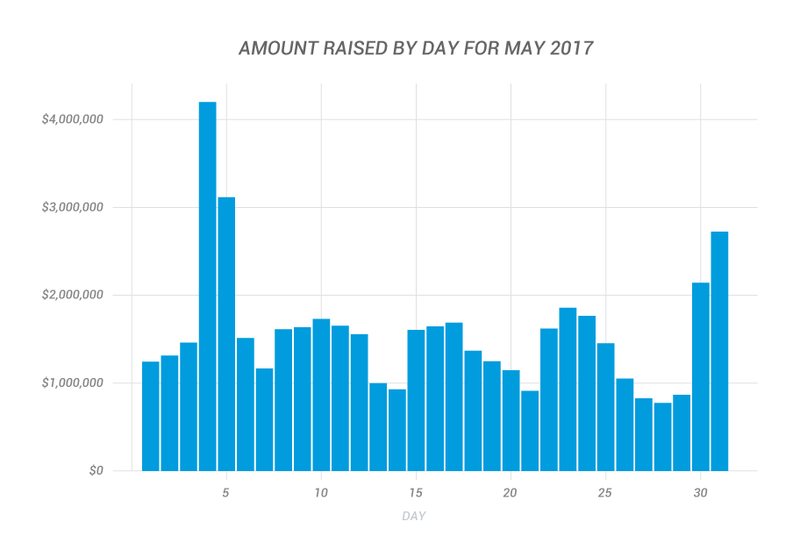 If you look at the fundraising totals of the biggest, smallest, and average days in the quarter as compared to past years, you start to see just how steady the fundraising was from day to day, and how so many groups, from small organizations to high-profile campaigns, have come alive and have worked hard to build people-powered movements. We certainly had some big days in Q2, but that wasn’t what ultimately led to a record-breaking quarter. As you can see below, the smallest day in Q2 2017 was 43% bigger than the average day in Q2 2015. 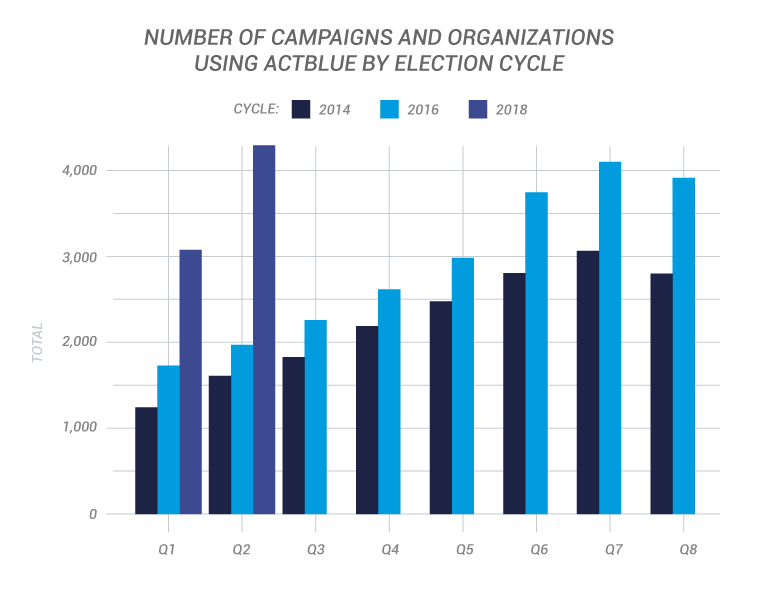 ActBlue Express continues to be one of the most powerful tools for campaigns and organizations. We hit 4 million ActBlue Express users just a few days before the quarter wrapped up, and those ActBlue Express users made 65.7% of the contributions in Q2. 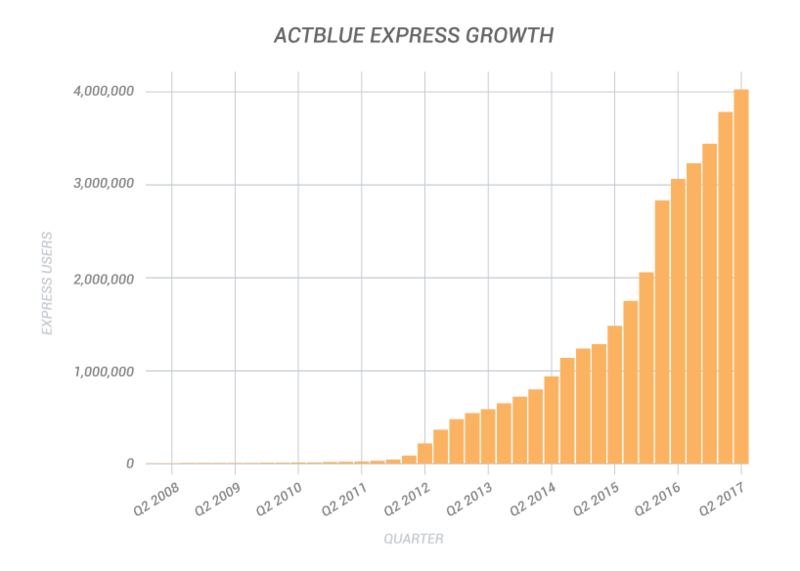 The chart below shows the incredible growth that got us to 4 million ActBlue Express users. Recurring contributions remained strong this past quarter, accounting for 41.6% of all contributions (that includes recurrences of pledges that were initiated before Q2 2017). Recurring programs continue to help campaigns and organizations build sustainable operations and plan for the future, and they allow donors to give a small contribution each month and have a big impact on the causes they support. Mobile contributions account for nearly half of all contributions made via ActBlue. We’ve worked over the last few years to ensure that the donation process is as smooth as possible for supporters, and that campaigns and organizations have access to the most advanced mobile technology, whether they’re a presidential campaign or a small upstart nonprofit. Apple Pay — one of our latest advancements for mobile — accounted for 6.2% of all mobile donations this past quarter, and helped bring in $3.2 million. We’ve been working to roll Apple Pay out to as many campaigns and organizations as possible since October, and we’re very close to being able to make it available to everyone, from local candidates to national nonprofits. While 2018 and 2020 are still a ways off, and there is much more work to be done, it’s been inspiring to see so many people take their anger and frustration and turn it into action. Across the country, people are jumping into the fray and running for office, starting new organizations, and chipping in as a way of fighting back. We’d love to hear how you’ve been using ActBlue’s tools to fight back. Let us know at info@actblue.com. Our numbers for May are in, and it was another huge month for small-dollar donor engagement. There’s been an incredible increase in May’s fundraising totals cycle over cycle — we processed three times the amount of money in May of 2017 than in May of 2015. 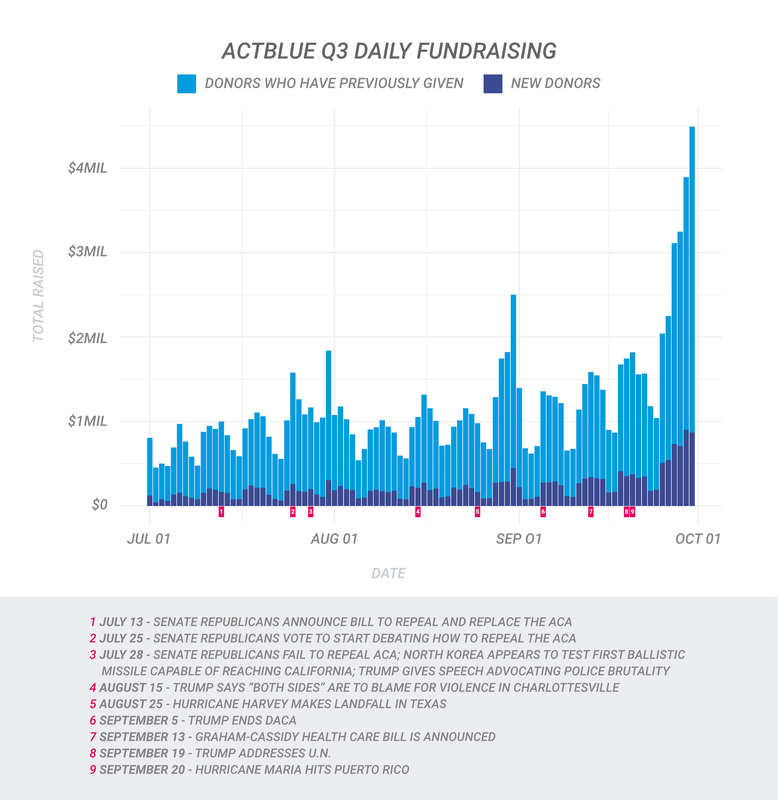 Similarly, more than double the number of groups raised money on ActBlue in May of 2017 than during the same month of the last election cycle. Collectively, more than 3,200 total groups raised more than $48M in May alone. Small-dollar donors are not giving up on making their voices heard, and new groups and organizers are getting involved in the progressive movement. When the AHCA bill went to a vote in the House during the first week of May, groups mobilized quickly as small-dollar donors made it clear they were ready to contribute and fight back. Here at ActBlue, we had all hands on deck and set up hundreds of Democratic nominee funds, where grassroots donors contributed millions of dollars in the days surrounding the vote. Check out the graph below, where you can clearly see the huge spike in dollars on May 4th and 5th, when donors were making their opposition to Trumpcare heard loud and clear. We’ve seen a steady stream of new, dedicated donors coming into the fold so far in 2017, and this past month was no different. More than 98k new donors saved their payment information with ActBlue Express in May. Those supporters are able to give to any of the thousands of groups using ActBlue with a single click. Recurring contributions are one of the biggest ways donors show their ongoing support for the campaigns and causes they care about. Rather than giving one up-front contribution, they’re able to chip in a small amount over the course of multiple months. The amount of recurring money groups are raising across ActBlue has grown at an incredible pace over the last few election cycles. In the graph below, we break down daily recurring totals cycle to cycle. Recurring totals tended to be pretty stable from day to day in May. That’s great for campaigns and organizations relying on their recurring fundraising as a way to budget and plan ahead, and indicates that donors are remaining committed to the causes and campaigns they’re passionate about. Our customer service team handled over 890 email conversations a day during the month of May. With so many new donors coming on board to support the groups fundraising on ActBlue, we’ve recently brought even more customer service representatives on to our team. They’re available around the clock to answer questions from donors, campaigns, and organizations alike, and make sure it’s easy for them to use ActBlue to make a difference. If you’ve got any questions or comments about our May breakdown, drop us a line at info@actblue.com.